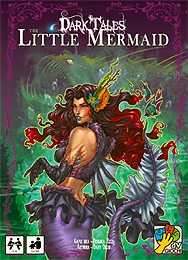 Experience one of the greatest classic fairy tales with DARK TALES - THE LITTLE MERMAID. From the old Sea King to the graceful Prince, from the loving sisters to the perfidious Sea Witch and her Pacts: in the world of Dark Tales, new characters appear to create new and unexpected combinations. Will the Little Mermaid convince the Prince to be her saviour, or will the Sea Witch win? When the story is over, it's time to play another. The ending can change yet again! Note: This expansion is not a complete game. You will also need the DARK TALES game to play.